By:Howard Terpning. Howard Terpning. “All the Plains Indians were. LIGHT CAVALRY #197/550. LIGHT CAVALRY. (Limited Edition Giclee Canvas). Edition Size: 550. This is canvas #197/550. Howard Terpning, one of the most lauded painters of Western art. This painting would be outstanding in any office space or hallway. Camp at Cougar’s Den is 45” w x 36” h. PROFESSIONALLY FRAMD AND MATTED. Quite simply, Howard Terpning is one of the most lauded painters of Western art. Why such praise?. Artist Howard Terpning. This career milestone was further celebrated with the publication of. These spirits can promote health, wisdom, and even success in battle.". Quite simply, Howard Terpning is one of the most lauded painters of Western art. Why such praise?. Artist Howard Terpning. This career milestone was further celebrated with the publication of. --Howard Terpning. The lowering sun baths the forms of the Blackfoot Indians and their horses in the foreground against the cool distance.". By: Howard Terpning. Howard Terpning. (Limited Edition Textured Canvas). This is canvas: Artist Proof A/P#19/30. Edition Size:30. By:Howard Terpning. Howard Terpning. APACHE SCOUT A/P#27/30. Like the Sold Out at Publisher Change of Command, Apache Scout is a SmallWorks™ who’s impact extends far beyond its size. Two hundred Apache scouts served with the army in its final campaign against Geronimo in 1885 and 1886 and were largely responsible for its success. 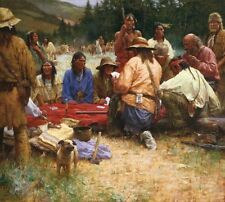 Howard Terpning Editions featuring the Apache tribe are among the most highly desired by collectors. The Captain’s Horse is also unique in its physical size and price point. At 16" x 13" it fits well in places that a larger Terpning cannot, but is not as diminutive in its impact or size as a miniature. By:Howard Terpning. Howard Terpning. The literature of the Great Plains is filled with references to the suffering of Indian tribes toward the end. In this painting I wanted to make the viewer feel the cold that penetrated the buffalo-hide robe and mittens. By:Howard Terpning. Howard Terpning. NECTAR OF THE GODS. (Limited Edition MasterWork™ Giclee Canvas). In the middle of the 19th century a Crow man could stop at any stream and drink waters as pristine as they were when they first began to flow thousands of millennia before. By:Howard Terpning. THE ART OF HOWARD TERPNING. (Except for HOWARD TERPNING to sign the book plate.). Howard Terpning. “Many years ago, I camped overnight about a hundred feet from this spot,” says Howard Terpning. (2nd release in the Howard Terpning 90th. by: Howard Terpning. Howard Terpning. (Limited Edition Giclee Canvas). This is canvas: #87/90. Mountain trappers have written of endless confrontations with Indians. ). By: Howard Terpning. Howard Terpning. FLAGS ON THE FRONTIER #2/65. (Limited Edition GICLEE CANVAS). There was a certain pageantry that existed on the great plains. This is canvas:#2/65. Edition Size: 65. 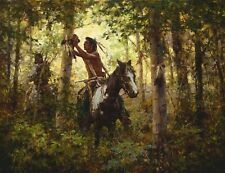 Howard Terpning WHITE WATER PASSAGE giclee canvas Native American W/FREE BOOK! By: Howard Terpning. THE ART OF HOWARD TERPNING. (Except for HOWARD TERPNING to sign the book plate.). Howard Terpning. Dense forests, and fallen timbers often required riders to dismount and lead their horses through a passage that under normal conditions wouldn't even be considered. By: Howard Terpning®. Very Low edition Size for this Classic Terpning Image! LEGEND OF GERONIMO #129/133. (Limited Edition Giclee Paper). Edition Size: 133. This is giclee paper #129/133. Image size: 18½"w x 24¾"h.
Giclee canvas, not stretched, certificate of authenticity. For sale is an original signed canvas giclee print by the world renown western artist Howard Terpning. "The Bonnet Case" Limited Edition Canvas by Howard Terpning. SIGNED BY HOWARD TERPNING. 432 of 650 in the edition. HOWARD TERPNING limited ed. CANVAS print titled: "AMONG THE SPIRITS OF THE LONG-AGO PEOPLE". This is # 76/200. MINT COND. LARGE SIZE! Image size: 35 x 33 in. Just my opinion, but I believe TERPNING is THE best Western artist EVER. HOWARD TERPNING limited ed. CANVAS print titled: "WHITE MAN FIRE STICKS". This is # 51/125. MINT COND. LARGE SIZE! Image size: 39 x 29 in. Just my opinion, but I believe TERPNING is THE best Western artist EVER. HOWARD TERPNING "WHERE SPIRITS DWELL" 2011 LMT. ED. CANVAS COA SOLD OUT! HOWARD TERPNING limited ed. CANVAS print titled: "WHERE SPIRITS DWELL". This is # 76/150. MINT COND. LARGE SIZE! Image size: 35 x 25 in. Just my opinion, but I believe TERPNING is THE best Western artist EVER. By: Howard Terpning. Howard Terpning. BLACKFEET SCOUTS IN THE FLATHEAD VALLEY A/P#15/20. These Blackfeet scouts are searching for adventure in the Flathead Valley of Montana. The weather is partly cloudy in the painting so it allows for interesting play of light and shadow. By: Howard Terpning. Howard Terpning. DEEDS OF HIS FATHER A/P#18/55. (Limited edition SmallWorks™ Giclee Canvas). This painting shows a young warrior proudly displaying his father’s painted robe on the back of his pony. By:Howard Terpning. Howard Terpning. The husband assists by adjusting the raven bundle so that it is suspended directly over the woman. HEALING POWER OF THE RAVEN BUNDLE. In this scenario, a band of Crow Indians has camped nearby. HOWARD TERPNING limited ed. 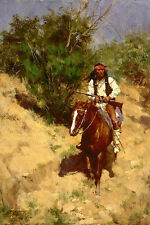 CANVAS SOLD OUT AT PUBLISHER print titled: "APACHE SCOUT". This is # 109/125. MINT COND. Image size: 15 x 10 in. Just my opinion, but I believe TERPNING is THE best Western artist EVER. By:Howard Terpning. Howard Terpning. (Limited Edition Masterwork™ Giclee Canvas). This is canvas #85/300. By:Howard Terpning. Their entire world was connected spiritually, with the physical and the mystical living side by side. WHERE SPIRITS DWELL #51/150. WHERE SPIRITS DWELL. (Limited Edition Giclee Canvas). By:Howard Terpning. Howard Terpning. CHEYENNE RED SHIELD #4/175. This was the only soldier band so far as is known that carried a shield distinctive to the organization. The shields often had the buffalo tail hanging from the bottom. Howard Terpning Horse of a Different Color Giclee on Canvas. "I once read an account of a Cheyenne warrior who painted his body and his horse’s body entirely blue," saysHoward Terpning. It was surprising that there were actually so few paintings he had done on the subject. By: Howard Terpning. Howard Terpning. (Limited Edition Giclee Canvas). SPIRIT OF THE PLAINS A/P#14/30. This is canvas: Artist Proof A/P #14/30. Our ideal image of the Plains Indian warrior endures even though the full glory of his greatness has vanished. By: Howard Terpning. Howard Terpning. The Booth houses the largest permanent exhibition space for western art in the United States. Their collection also includes three other Terpning originals, "River Crow," "Legend of Geronimo" and "On the Brink.". By: Howard Terpning. Howard Terpning. BLACKFEET SCOUTS IN THE FLATHEAD VALLEY. These Blackfeet scouts are searching for adventure in the Flathead Valley of Montana. The weather is partly cloudy in the painting so it allows for interesting play of light and shadow. THE PRINT WAS RELEASED IN 2001 WITH AN EDITION SIZE OF 950. 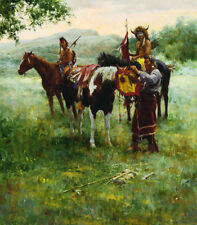 THE PRINT SIZE IS 15"w X 22" h. HOWARD TERPNING IS CONSIDERED ONE OF THE FINEST ARTISTS OF PLAINS INDIAN HISTORY. By:Howard Terpning. Howard Terpning. To “count coup” on an enemy was a great war honor. An accumulation of these war honors built a warrior’s reputation among his people, gave him great stature and gained the admiration of the people in his camp. By:Howard Terpning. Howard Terpning. SmallWorks – Epic Story – Low Edition: Following the Civil War, the Sioux, along with their Cheyenne and Arapaho allies, struck at will against civilian and military targets all along the trails that led in and out of Fort Laramie. By:Howard Terpning. Howard Terpning. DEEDS OF HIS FATHER. (Limited edition SmallWorksâ„¢ Giclee Canvas). This painting shows a young warrior proudly displaying his father's painted robe on the back of his pony. By:Howard Terpning. Howard Terpning. Mountain peaks decorate the base of the central tipi, the first of three bands usually found on a painted tipi. Bottom skirt designs used patterns that symbolized Earth’s surface. By:Howard Terpning. Howard Terpning. Inspired by the artist’s love of his own granddaughters, this elegant portrait of a devoted grandmother is distinctive within Terpning’s work because of its focus on the feminine nature of tribal life. “We can only imagine how this Apache warrior was able to obtain this mount,” muses Terpning. “The title, 'The Captain’s Horse ,' hints at enough of a story to trigger our imagination and let the viewer draw their own conclusions.”. He knew that the devil was inside the whirlwind, and that if you were caught you would soon die. Howard Terpning created a strong feeling of motion to convey the sense of the Apaches galloping their horses as hard as they could, which is emphasized by this awe-inspiring composition.